Mitochondria are critical organelles in the metabolic regulation of almost all eukaryotic organisms. Knowledge of their biochemistry and molecular biology in plants has been fuelled over recent years by the rapid progress made in genome sequencing and the ability to manipulate gene expression. Plant Mitochondria contains chapters written by many of the world’s leading researchers in this area, bringing together and reviewing for the first time many recent advances. Contents include coverage of mitochondrial dynamics, mitochondrial genome instability, expression of the plant mitochondrial genome, import of nuclear-encoded mitochondrial proteins, mitochondrial respiratory complex biogenesis, supramolecular structure of the OXPHOS system, mitochondrial electron transport and oxidative stress, mitochondrial metabolism, cytoplasmic male sterilities and mitochondrial gene mutations, and the mitochondrion in plant programmed cell death. 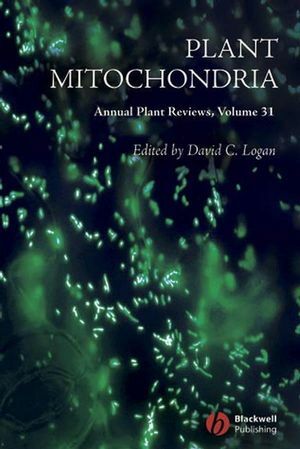 Plant Mitochondria is an extremely important and timely addition to Blackwell Publishing’s Annual Plant Reviews series. David Logan, well known and respected internationally for his work in this area, has brought together a truly valuable volume of great use and interest to plant scientists, cell and molecular biologists, and biochemists. Libraries in all universities and research establishments where biological sciences are studied and taught should have copies of this important book on their shelves. 1 Mitochondrial dynamics: the control of mitochondrial shape, size, number, motility and cellular inheritance. Iain Scott and David C. Logan. 2 The unique biology of mitochondrial genome instability in plants. 3 Expression of the plant mitochondrial genome. Dominique Gagliardi and Stefan Binder. 4 Import of nuclear-encoded mitochondrial proteins. Elzbieta Glaser and James Whelan. 5 Mitochondrial respiratory complex biogenesis: communication, gene expression and assembly. 6 Supramolecular structure of the oxidative phosphorylation system in plants. Jesco Heinemeyer, Natalya V. Dudkina, Egbert J. Boekema and Hans-Peter Braun. 7 Mitochondrial electron transport and oxidative stress. Adriano Nunes-Nesi and Alisdair R. Fernie. 9 Cytoplasmic male sterilities and mitochondrial gene mutations in plants. Françoise Budar and Richard Berthomé. 10 The mitochondrion and plant programmed cell death.